Powder foundation was one of my favorite makeup products back when I was a teen. I remember putting on my powder foundation before going out, feeling like a top model. However, I was using the wrong shade. It took me a while to figure out the right powder foundation in the correct shade for my skin. Today, I am using the right shade but also other makeup products that help me get that flawless silky skin that everybody wants. Yet, powder foundation helps me a lot in the process. Without it, I feel like something’s missing. I feel incomplete. It sounds strange but I know makeup freaks will understand. If you want to learn more about powder foundation and how to use it, keep on reading. I will share the best tips and tricks on powder foundation, teach you how to pick the right powder foundation for your skin and how to apply it properly. I’ll also share a list with the powder foundations on the market and help you chose the best product. What is powder foundation and why do I need it? How to choose the right powder foundation? How to apply powder foundation properly? No matter if you’re a fan of matte or glowing powder, this makeup product is a must if you want to get that perfect flawless finish. Powder foundation is designed to fix your uneven skin tone and help you hide all the imperfections on your face such as blemishes. However, when it comes to face powder, you have two main options. You can go with a pressed powder foundation. Or you can choose the loose powder foundation. They both have the same purpose. And the only difference is in the packaging. As you can assume, the pressed comes pressed into a compact while the loose one comes in a jar or tube. If you want to achieve that luminous finish, the loose powder foundation is a perfect choice. Most loose powders have a silky texture. They can be used as setting powder to finish your look. Pressed powders, on the other hand, aren’t that messy and absorb very quickly. But, you have to pick the right shade and apply it right to get the best results. Choosing the best foundation for you depends on your skin type. For example, if you have an oily face, powder foundation is the perfect choice for you. It will reduce the shine and stick through the day, without getting cakey. Also, it’ll give you that matte silky look you’ve been dreaming of. But there are several types of powder foundation. Pressed powder foundation: If you have oily skin, pressed powder foundation is the perfect choice for you. It will control the excess oil and reduce the shine. Also, pressed powder foundation is easy to apply and blend. It comes in a compact form. You can apply it with a brush or a sponge. Mineral powder foundation: If you have sensitive and acne-prone skin, mineral powder foundation is the perfect fit for you. Made of special minerals that calm inflammation and heal the skin, mineral powder foundation will give you that flawless silky look and take good care of your skin. Liquid to powder foundation: If you want a semi-matte finish, liquid to powder foundation is the right choice for you. It’s ideal for dry skin because water is the main ingredient. It will keep your skin well-hydrated. This type of foundation is long-lasting and gives the skin a smooth silky look. Cream to powder foundation: If you have combination skin or partly dry skin, cream to powder foundation is the best fit for you. Cream to powder foundation is a combination of pressed and cream powder foundation. It comes in a compact form but it is creamy. It will give you a matte finish. Extra tip: Never buy a foundation before you know your skin type. Also, keep in mind that skin texture sometimes depends upon the weather. During winter, your skin might get dryer than usual. However, if you have dry skin, pick the oil-based foundation, while people with oily skin should choose a water-based foundation. If you want to cover your imperfections and add a glow to the skin, a cream foundation is the best choice for you. When it comes to choosing the right shade, try the foundation on the jaw lines before buying. Look for a color that will match your skin perfectly and blend till disappearing. These are the top 10 powder foundation on the market. However, it’s up to you to decide if you want to stick to your current product or experiment a little. If you’re looking for a powder foundation provides sheer to medium coverage, the Jane Iredale Amazing Base Loose Mineral Powder is the best fit for you. Made of micronized minerals, this powder is weightless and oil-free. Meaning, it’s perfect for people with oily skin. You get 3 in 1 product because Jane Iredale Base Loose Mineral Powder is also a concealer, SPF 20 foundation, and powder. It’s also waterproof to 40 minutes. Do not worry about the foundation getting into the fine lines or wrinkles because this foundation is designed to hide all your imperfections. If you have sensitive skin, don’t worry because Jane Iredale powder foundation won’t cause you irritation. It’s an organic product without noticeable shimmer. You can apply it with a brush but it’s suggested that you use a clean sponge. Also, the color in the container might appear a bit darker but it will match your skin perfectly. It’s one of those powders that you can’t help falling in love. No need to reapply. Easy to use. Suitable for all skin types. It provides a natural finish. What’s not to love about it? Dermablend Intense Powder High Coverage Foundation is the foundation to buy if you want a medium/full coverage. It’s a blendable foundation that provides a matte finish. Don’t worry if you have sensitive skin because this product is allergy-tested, sensitive-skin tested, dermatologist-tested and fragrance-free. It’s ideal for combination and oily skin, especially for oily skin because it’s an oil-free foundation. You can apply it with a brush or a beauty sponge. However, I suggest that you use the sponge because, in my experience, it blends better with it. The Dermablend foundation lasts up to 16 hours wear. It’s highly pigmented and will match your skin tone perfectly. I forgot to mention that it’s highly recommended for acne-prone skin because it’s made to cover all your imperfections like acne, redness, freckles, birthmarks or correct your uneven skin tone. Definitely, a must-have product if you want flawless looking skin. Made of pure minerals, Elizabeth Arden Pure Finish Mineral Powder Foundation offers you pure comfort. It’s a lightweight product that won’t feel heavy on the face. It’s a microlight, high-quality makeup that will definitely make you fall in love at first wear. Ultra buildable and blendable, Elizabeth Arden Powder Foundation is pure perfection. According to many customer reviews I’ve read online, it’s comfortable to wear and feels light to the skin. If you have been dealing with messy foundations as I did in the past, you’re going to love this one. No mess and waste. No drying and getting into the lines. Made with fresh ground technology, this light powder will blend perfectly on your skin. And the best part of it is that it contains vitamin A, C, and E, calcium magnesium, sea water complex, and antioxidants to strengthen your skin. Fragrance-free and talc-free. The groundbreaking skincare components of the PÜR 4-in-1 formula will not only provide the best coverage but also take good care of your skin. It’s one of the few foundations adored by many in the world. It’s a lightweight foundation that allows the stress-free and mess-free application. You will adore this foundation. It’s the all-in-one product that everybody wants to have. You get a concealer, a powder, a foundation and an SPF 15 in just one packaging. And the best part of it is that it comes in 11 unique shades. This is pretty cool because not so many beauty companies offer a wide range of foundation shades to choose from. I’ve heard one of the beauty gurus on YouTube say that if you’re a makeup company and you offer only a few shades of foundation in the 21 century, it’s not good because there are so many different skin colors and you have to meet all your customer requirements. And he was absolutely right. That’s why I trust this company. They truly care about the customers and provide one of the best products, such as this foundation. It’s not only a powder but also a skincare product that will make sure your skin looks soft and perfect. For light coverage, it’s suggested that you use a powder brush. However, if you want full coverage, apply with a dense chisel brush. For spot covering, use a concealer brush. Laura Geller New York Powder Foundation is one of my favorite on the list because it provides a breathable, weightless and flawless finish. If you want medium to buildable coverage, it’s suggested that you apply dry. And if you’re for a more impactful finish, apply wet. Made with Active Mesh Technology, this foundation has a long-lasting baked formula that provides the best, breathable and perfect coverage. I don’t know about you, but I always looked like cemented when applying powder makeup because I was using the wrong product. With this powder, I’m proud to say that I have finally accomplished a naturally luminous finish. I fell in love with this foundation at first wear. I’m sure you will too. It goes smoothly on the skin and covers well. A must-have. It’s perfect for oily skin because it controls the extra oil and lasts for many hours. It’s a makeup product I use every day because it provides outstanding and quality coverage. I always suggest that you buy makeup products with SPF because it’s important to keep your skin protected. This powder foundation, just like most of the products I reviewed on this list has SPF 15. It will take good care of your skin while providing full coverage. It’s specially designed for oily skin, however, people with combination or sensitive skin can use it too. It’s a weightless product that provides a flawless and long-lasting finish. Just dip your brush into the product and let Bare Minerals do the rest. If you want full coverage, use a kabuki brush. But if you want lighter coverage, it’s recommended to use an application brush. Apply in a circular motion for the best results and remember that less is more when doing your makeup with Bare Minerals SPF 15 Matte Foundation. According to many reviews I’ve read online about this product, I’ve noticed that people with sensitive skin love this product. Also, most of the customers receive compliments about their skin complexion. And they all blame it on Bare Minerals. I don’t know about you, but I want to see if it for myself. Life’s too short to stick to one foundation only. Mary Kay Mineral Powder Foundation offers buildable coverage that blends easily and will give you that flawless look that you’ve been dreaming of. The transfer-resistant and long-lasting formula will make sure that you look flawless during the day or night. It’s perfect for oily and combination skin because it controls the shine and extra oil. However, people with sensitive skin can use it too. According to the reviews of most people who use this product for a long time, I’ve found out that it provides excellent coverage. However, it doesn’t feel heavy on the face. On the contrary, it will make you feel comfortable because it’s a lightweight product. If you’re looking for the perfect foundation that will cover all your flaws and imperfections, but provide a natural look, this is the one. Easy to use and recommendable by many ladies in the makeup industry. If you want an even tone and radiant skin, Laura Geller New Year Deep Baked Balance-N-Brighten Foundation is the product for you. It contains color-correcting pigments to help you get that flawless finish and make you feel comfortable in your skin again. It is a weightless product that offers full creamy coverage and won’t make you feel like you are wearing a “mask”. Instead, you will get that healthy beautiful glow we all dream of. It covers the imperfections and flaws without getting into the fine lines and wrinkles. Definitely, something I would try. It’s a high-quality product that won’t let you down. The easy-to-use formula, the Em Michelle Phan Love Me For Me Flawless Finish Powder Compact is the ideal choice for people who like products that multitask. No matter if you wear it alone or over makeup, this product will make sure you look flawless through the day. Thanks to the silky texture formula, the powder provides natural-looking, full coverage, and perfect soft finish. Just pick the matching shade and you’re ready to go. You can apply it with a brush, or a beauty blender. I personally prefer beauty blenders because they help me blend the product better. With this product, you won’t feel like wearing a “mask”. On the contrary, you will feel beautiful and comfortable throughout the day or night. Michelle Phan Powder is often said to be the superhero of powders. However, I won’t take people’s word for it and try it on my own. I’ve watched Michelle Phan’s videos on YouTube and I believe she did a good job with this promising powder. To be honest, I didn’t found any description of the product online. However, I did find a lot of positive reviews, so I will try to review this product on their behalf. I guess the company doesn’t feel like explaining the product because they already have a reputation and offer quality products only. COVERGIRL Ready Set Gorgeous Pocket Powder is ideal for both oily and combination skin because it controls shine and reduces extra oil. Also, it absorbs the oil and gives the skin a healthy natural glow and shine-free matte finish. And the best part of it is that it is available in various shades, so customers can easily find their matching shade. It will blend perfectly on the skin and will even out your skin tone. For the best results, it’s suggested that you combine it with the Set Gorgeous concealer. They both provide glam coverage and flawless finish. An oil-free, glam product that won’t clog your pores. Applying powder foundation for someone who’s been doing makeup since forever is an easy task. However, if you’re doing it for the first time, it can be a challenge. 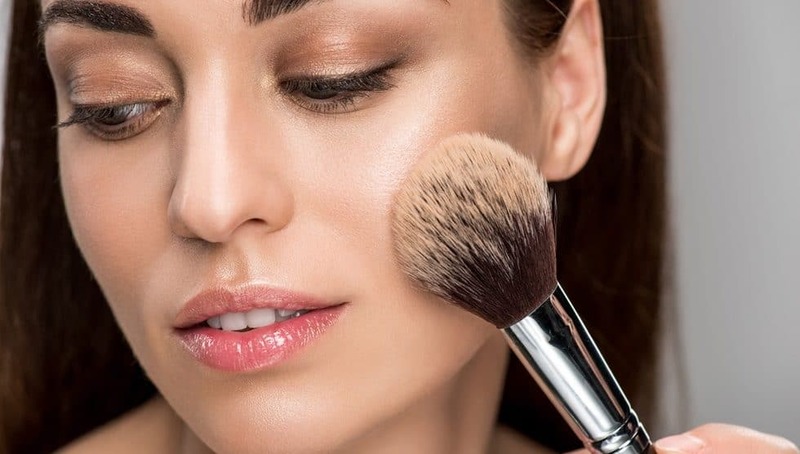 You can apply powder foundation with a brush or a sponge. However, first, you need to do this. Clean your face: It’s very important to clean your face before you apply powder foundation. And any other makeup product, in general. Use a mild facial cleanser and cold water. After, pat your skin dry with a clean towel. Follow the next step. Hydrate your skin: Apply a moisturizer that is suitable for your skin type. And make sure it contains SPF, so it can keep your skin protected. Apply the last tip. Prep your skin: Applying a primer isn’t mandatory. However, most women use it because it evens out their skin tone and makes their makeup last longer. If you want to use a primer, start with the nose. Make sure your whole face is covered. Give it 5 minutes until you start applying your makeup with a brush or a sponge. Step 1: Make sure you have the right brush in hand. This means that you need to pick the right size because different brushes offer different coverage. For example, if you want the full coverage, you should get a rounded thick brush. Most people buy a kabuki rounded brush, which you can purchase at almost every department store. But the size and type of your brush also depend on the foundation you’re using. For example, if you want to apply a powder foundation on top of cream or liquid foundation, it’s best to get a rounded brush. It provides light coverage. If you’re one of those who doesn’t need a lot of foundation because their skin is flawless, use a long brush with dense bristles. Step 2: Dab your brush into the product and use circular motions when applying on your face. Keep your brush in a horizontal position while dipping it into the product to allow it to get into the bristles more easily. Start with applying on your forehead, cheeks and below your eyes. Apply on any area you see discoloration. For acne, use a light dusting. Step 3: Don’t rush the process because applying a powder foundation isn’t as easy as it seems if you’re not a professional. You need to practice before you start applying it the right way. Start slowly and give yourself time and space for making the usual mistakes. Step 4: Don’t worry if you notice clumps after applying powder foundation. They can be removed with a brush once you’re done. Take a clean brush and dust off everything that doesn’t look natural. Use the brush to blend the product until your skin looks flawless. If the powder foundation changes your skin color, you’re using the wrong shade as I did back in the time. The correct shade won’t change your skin tone but make it even and make your skin appear smoother. Pick a shade that is closer to your natural skin tone. Step 1: If you go full coverage like me, use a sponge instead of a brush when applying your foundation. Using a beauty sponge is a better option for people with acne (I don’t). Step 2: Dab the sponge into the product but don’t press too hard. Start light because, in my opinion, it’s better to apply a small amount before you go in deep. And if you want better coverage, spritz setting sprays on your sponge before you dab into the product. Step 3: Use a wet sponge if you have acne or problem areas in order to cover it better. Instead of setting spray, you can dip the sponge into water. But don’t forget to squeeze it before you dap into the product. Focus on target spots and apply in a circular motion. Step 4: Use a clean brush to blend the powder foundation better and get rid off the extra power. Your skin should look perfect and natural if you followed all of my rules. Extra tip: Never use your fingers to apply powder foundation. It may work for cream or liquid foundation, but it won’t work with powder foundation. Your fingers will not give you the same precision of a quality brush or a sponge. I personally use a beauty sponge. Just like any other makeup products, powder foundations have their pros and cons. If you want to learn more about the pros and cons of powder foundation, keep on reading. Light coverage that gives your skin a more natural appearance. Works well with oily and young skin because it absorbs excess oil. Contains fewer preservatives and additives than other foundations. It doesn’t get cakey when the weather is too hot or too cold. You can easily re-apply it if needed throughout the day or night. If you’re not a fan of brushes, powder foundation might not be for you. It’s mostly applied with a brush. But feel free to use a sponge if it fits you better. Powder foundation can get messy, especially if you’re a beginner. You can add powder on your clothes and ruin your appearance if you’re not careful enough. It can get into wrinkles and fine lines and aggregate around damaged/dry skin. It will take you a bit longer to apply powder foundation because it needs to be applied multiple time to get full coverage. If you’re one of those people with oily T-zone but dry skin, the powder foundation can cause uneven color distribution. I don’t know about you but I love powder foundation. It’s the only product that makes me feel complete. Without it, I feel like my makeup isn’t done yet. Powder foundation gives you that natural finish if you apply it correctly. It’s very useful for people with oily skin because it controls the extra oil around the nose area and the forehead. It’s perfect for younger people who have just entered the world of makeup. It might take you a while to learn how to blend powder foundation if you’re a beginner. However, you will master the technique over time. I honestly hope you find this article helpful. Keep in mind that a good match should be invisible. It shouldn’t change your skin color at all.